Membership Benefits with Unlimited Sessions: Priority scheduling, Bring a friend or family member FREE once a month, and 20% off facial services. One room will run on the hour 9:00am - 5:00pm. Last Call Salt Session will be from 5:00pm - 5:45pm. One room will run starting at 9:30am - 6:15pm. Last Call Salt Session 5:30pm - 6:15pm. This room will run on the half hour (still 45 minute sessions). *Children ages 0-6 receive a complimentary parent in the room with them. *Children's sessions will run every hour. Kids need to bring clean socks with them for the session. Great For Moms Night Out, Bridal Shower, and More! Ask how to become a member! Every wall surface, including the floor & ceiling, is covered with natural rock salt to create a sterilized and negative ion environment. Salt Room Winter Haven also uses the newest top-of-the-line halogenerators to crush pharmaceutical grade salt into small particles for inhalation creating the microclimate. 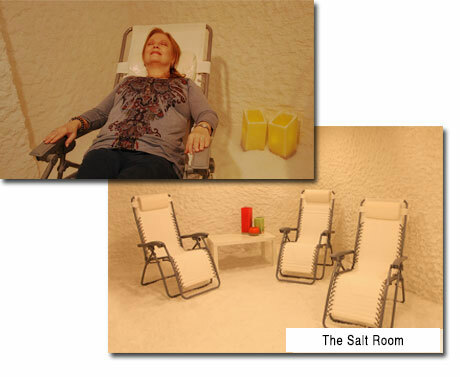 Each salt therapy session at Salt Room Winter Haven lasts 45 minutes. You can read a book or even take a nap while relaxing to the calming background music playing in the room. Your comfort is ensured by our Zero-Gravity, NASA inspired recliners. With your feet elevated at your heart-level or slightly above, this position puts the least amount of strain on the spine neutralizing the effects of gravity. The Zero-Gravity recliners allow you to relax while you’re seated and lets the discs in your spine return to their normal shape.